Kieran Band (9) celebrates his opening goal. Kennoway were looking to get their first points on the board as they faced Downfield who have also been on the end of a bad run of results. The game started positively for the home side with a front three of Collins, Band and R Muir pressing high against the Downfield defence. The energy and pace the players were showing was pleasing on the eye for the home support as first Collins had an overhead kick cleared off the line then a good run on the right ended with Mair`s cross flashing across the goal. As the half wore on the tempo dropped and Downfield started to have chances of their own, Paterson raced out of his goal to make a fine block when the Downfield striker got his shot away. The set piece count was mounting for KSH as a succession of corners and free kicks in and around the box seemed to be the best way for the home side to open the scoring. First a header from Doig tipped over then a header from Band saw the ‘keeper follow suit when he made sure the half ended all square. As the teams returned for the second half there was a tension in the air. By far the more dominant team KSH knew they had to take something from this game and the pressure that was on the players was building. 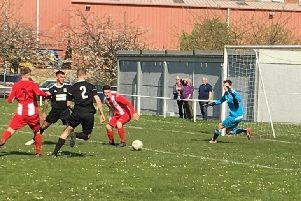 Brewster and Doig in the heart of the KSH defence were a particular stand out as the battled it out with the bustling striker from Downfield. Another Doig header from a Johnstone corner kick was saved yet again by the young `keeper. A snapshot from D.Muir also saw a save that showed the away ‘keeper in fine form. Downfield had the ball in the net with one of their few forays of the second half but the flag was already up as the forward strayed into an offside position. With ten minutes remaining Johnstone fed the ball to Band on the right wing,the striker played a ball deep into the direction of the goal,the `keeper misjudged the flight of the ball as the ball crashed into the net for that bit of luck the home side were needing. KSH: Paterson, Mair, Brewster, Doig, Johnstone, R Muir, Craig, D Muir, Watson, Band, Collins. Subs: B Rolland, L Rolland, Swinton, Bryce, Lindsay. Next up is away in the Scottish Cup to Murray Hall.